Be sure to click here to check out our "Preview of the Show Gallery"
The next show at Image City Photography Gallery should have wide local appeal. Wide, because the photographs on exhibit will include many panoramic views of the Rochester area. Sheridan Vincent, a gallery partner, will exhibit a selection of his photographs in a show titled “Panoramic Rochester.” After shooting his first panoramic photography four years ago with a 2 mega pixel digital camera, he has made good use of the digital technologies that have advanced considerably in that time. With high resolution digital cameras and third-generation software, he “stitches” together up to 10 individual digital images to prepare highly detailed photographs. One example will be a cityscape photograph that is 13 feet wide. 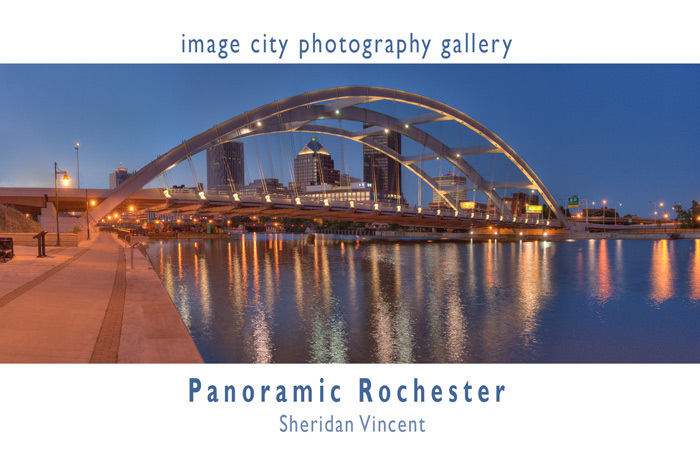 Sheridan specializes in local Rochester photographs, especially panoramic scenes. Sheridan has spent his entire work experience involved with photography, starting in high school with a part-time job at a Midwest photofinishing plant processing other people's film. This led to an interest that resulted in a 30 year career as a chemist at Kodak, where he was involved with the design and development of processing chemicals for color paper. He says “In my retirement, it is especially satisfying to be a photographer using the products that I helped to invent. I also have a great time learning and applying current technologies to produce photographs that would have been impossible for me to accomplish in the past.” Sheridan is a resident of Greece, NY. For more details: phone 271-2540, email svincent@frontiernet.net.